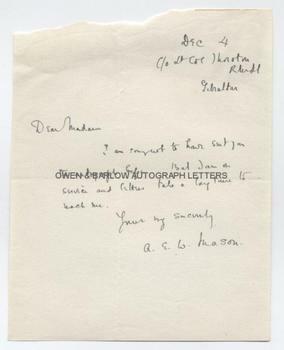 A E W MASON Autograph Letter Signed. Alfred Edward Woodley Mason. British (English) author of 'The Four Feathers', etc. ALS. 1p. c/o Lt. Col. Thoroton, RMLI, Gibralter. December 4th No year but probably 1917. 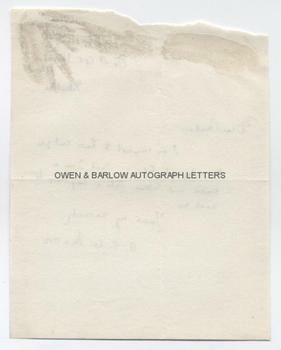 "I am sorry not to have sent you the autograph before. But I am on service and letters take a long time to reach me." 8vo. Approx 7 x 5.5 inches. Loss to top edge, probably where Mason had roughly torn the sheet from a pad. Mounting traces to verso. Very good. A E W Mason served with the Manchester Regiment in the First World War and transferred to the Royal Marine Light Infantry in 1917 with the rank of Major. The c/o address on this letter indicates, therefore, that it was written in 1917. Mason's military career at this time is somewhat mysterious but he was attached to British Intelligence and counter-espionage. His best known novel, 'The Four Feathers' (1902) tells of the disgraced "coward", Harry Faversham, who goes under cover in the Mahdist War and performs acts of courage to rescue his friends and win back the heart of the woman he loves. It is a classic of the genre and has been filmed many times.